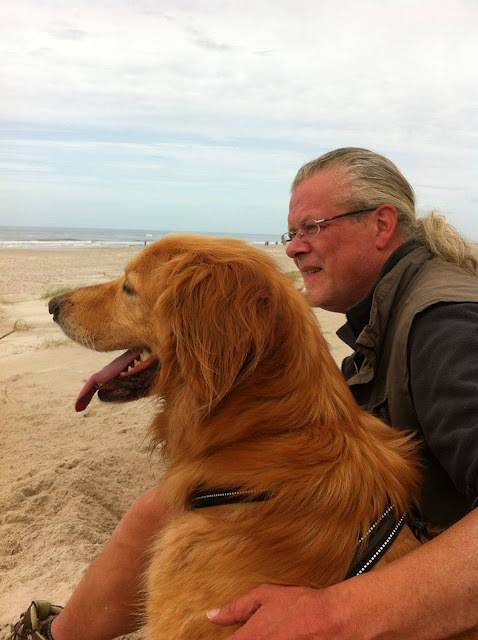 I'm Leo, a Dutch expat living in Denmark. When I looked into the eyes of a Hovawart puppy almost a decade ago, the left-over of the litter because "it" was not show-material, I couldn't in my wildest imagination grasp the change he would bring into my life. My suit-and-tie are long since exchanged for all-weather gear. The frequent-flyer card lost its mileage and a long line of dog books replaced the Michelin guide. That puppy, we named him Kenzo, sadly left this world in December 2015 only 8 years old, like we also lost Viva before him. But even in the abyss of grief there can be new beginnings. Today I have Tilde and Zerline at my side and together we live life as Kenzo taught us. We chase sunsets, play on the beaches, meet with friends. We hike the dunes, the wide and open heath fields, the forests and the hills of the rugged and relentless Danish West-coast. Always close, keeping each other safe, living in the moment, and honoring Kenzo. How about you? Drop a comment below, or mail us at kenzohw (at) gmail (dot) com. For blog updates, subscribe via email here. sorry, my english is not so well as yours, but I want to write, that I have looked Kenzos videos on you tube and I thought I´d seen my Artus. Kenzo plays like an kangeroo,too. And he looks like Artus. Where did you get him from? thanks for your greatings. I surched in Artus´pedigree, but I didn´t find someone like you. But don´t worry, i think all hovawarts are related, because all have the same forefathers. There are not so many hovawarts in the world, and they all were breeded from Mr. König and so all have their roots in Germany. So, Andra and Artus have forefathers like: "von der Poststraße", "von der Ehrenpforte", "vom Hohefeld" also very old german breeders. But it´s very interesting, that Kenzo and Artus are like twins. Perhaps there is a forefather we don´t know. Have you looked at the father of Artus? Baxter is 8,5 years old now and I think Artus will become the same. You have done a link to the Blog form Antonia and Balou. Antonia is a cousin from Baxter. And Aiko is a brother from Andra. Yes, I saw the pictures from Baxter. The resemblance is striking. Their facial expression, their coat and how they are generally build. They are very much alike. I also noticed Baxter weight was only 37kg. Like Kenzo's 39kg, which is light for a Hovawart male. HI!I adopted a Hovawart, from a foster of the American Hovawart Club. He was originally from the hof-joy kennel. I did not know anything about it. I saw the dog in their website and knew he was my dog. I lucked OUT. hE WAS gorgeous, loving, easily trained, level headed, good with kids, cats, people, snow, water. I am saddened to know that they are still abusing animals of any kind. Puppy mills in America are run by the same types of sociopathic, lazy, cruel kind of people. Education is the only answer and putting those people behind bars!